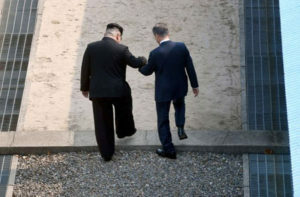 Kim Jong-un made history on Friday by hoisting his body up a weathered, cracked slab of concrete unaided. 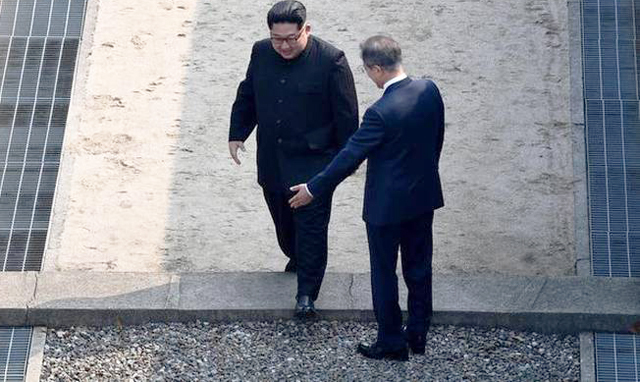 Millions held their breath as the North Korean leader walked up to greet South Korean President Moon Jae-in before taking the six inch launch up the step. Both leaders then walked along a red carpet into South Korean territory, where a honor guard stood at attention for inspection and school children gave Kim Mcdonald’s cheeseburgers. “This is the kind of thing you will enjoy once joining the developed world,” Moon told Kim. Kim “thoroughly enjoyed” the cheeseburgers but spat out the pickles, narrowly missing the red carpet. After the meal, Kim Jong-Un needed assistance going back down the step back into North Korea. Japan’s Prime Minister Shinzo Abe is now calling for an early general election after seeing the two Korean leaders hold hands and subsequently losing his most effective bogeyman.